Silver & GOLD PRICES were thumped with a knobbly stick today. The GOLD PRICE peeled off $20.9 (1.7%) to land back on support at $1,206.90. SILVER – oooo — lost 3.74% or 66.2 cents to end at $17.05. Both SILVER and GOLD PRICES sank beneath their 200 DMAs today. Now the gold price stands at all that support around $1,200 – $1,205. 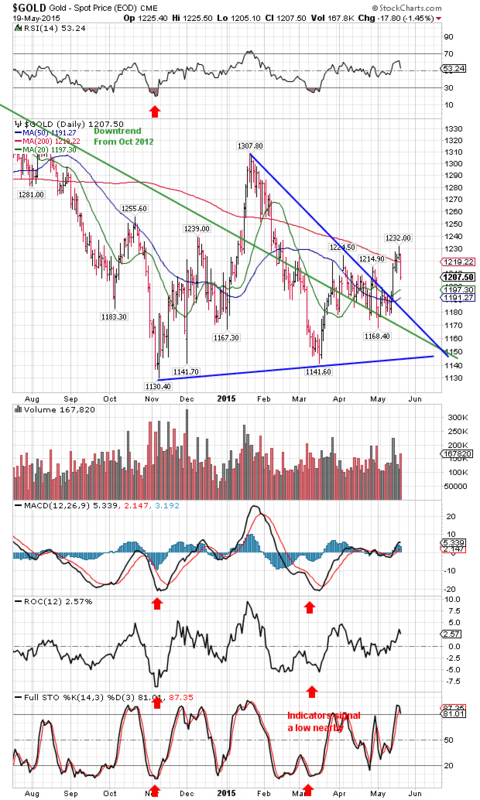 The silver price has support at $17.00, but more at $16.80. Gold’s strongest support stands around $1,180. Two ways to look at this. If silver and gold prices suddenly turn back up, it’s merely a short correction in a much larger rally. If they stall and fall & trade sideways for a month, they’re not ready to rally yet. If gold can hold above $1,195 and silver above $16.80, they’ll look strong. Otherwise they can lollygag into seasonal low time in June. Because previous declines have been stopped at the uptrend line from the December bottom, I expect that to stop them again. Top triangle boundary for silver is about $16.65 tomorrow. I’m going to be watching close as a mongoose at a snakehole the next couple of days and if silver or gold draw near $16.80 and $1,180 (maybe $1,190), I’ll buy some. But what do I know? Where I live electricity ain’t been invented yet! I think I’ll blame today’s gold & silver performance on the US dollar index. Yeah, that works. Say, I can blame it on stocks, too! Wreaking the vengeance of a falling wedge, the US dollar index today came blowing up out of that wedge’s point and rose 110 basis points (1.16%) to close at 95.36, just above its 20 DMA (95.28). Well, come on now. After it fell from 100.27 to 93.15 without much of a rally, it’s entitled to a little snapback now. Since ALL (that’s a-l-l) currency exchange rates are manipulated, we can’t know whether this was a deal among our friends at the Fed with the ECB and BOJ friends, or just the market still hot to buy dollars because they worked for 10 months. By now, though, after all the pain the high dollar caused, I’d bet the Fed doesn’t really want it to keep rallying. Technically it’s goose is cooked, and cooked geese don’t fly. This is a countertrend rally. The Frankenkurrency, the euro, lost 1.44% to $1.1149, ignominiously gapping down. Y’all do understand why I emphasize these gaps, up or down? They witness an extraordinarily strong move, usually the foretaste of more moves to come in the same direction. Euro fell plumb to its 20 DMA & closed there. In this case, the euro also pierced its uptrend line, calling its rally into question. Man, that is one sorry currency, even amongst a world of sorry fiat currencies. How do you say “most scrofulous”? Yen has sunk for 4 days, until now it’s back below its 20 & 50 DMAs & headed for the bottom of the range (82.25). Sick as a dog. Inflation markets don’t look too pert today either. WTIC walked through its uptrend line days ago but hasn’t followed through with a breakdown. Closed down 3.93% at $57.99/barrel today, just below its 20 DMA. Gravity’s catching up with it. Copper took a nasty fall below its 200 dma today, which it had been riding. That party’s over for a while. Yields on the 10 and 30 year US treasuries rose again today. That makes their trip back to the 200 DMA look like a touchback before moving higher. Janet Yellen’s going to be wishing she had another job, maybe operating an elevator someplace or changing tires. Inching to a new high on measly volume, the Dow rose 13.51 (0.07%) to 18,312.39, a new high NOT confirmed by the S&P500. It lost 1.37 (0.06%) to 2,127.83. Y’all ever involved in waiting for a baby to be born? You know the due date, but you keep thinking, “Well, maybe two more weeks, but maybe we have to go tonight.” Same thing with stocks right now. Dow could rise another 200 points and I wouldn’t be surprised, or they could fall 500 tomorrow. Either way, they will be lower a month from now, or my name’s not Peg Leg Pete. Wait — that’s not my name.